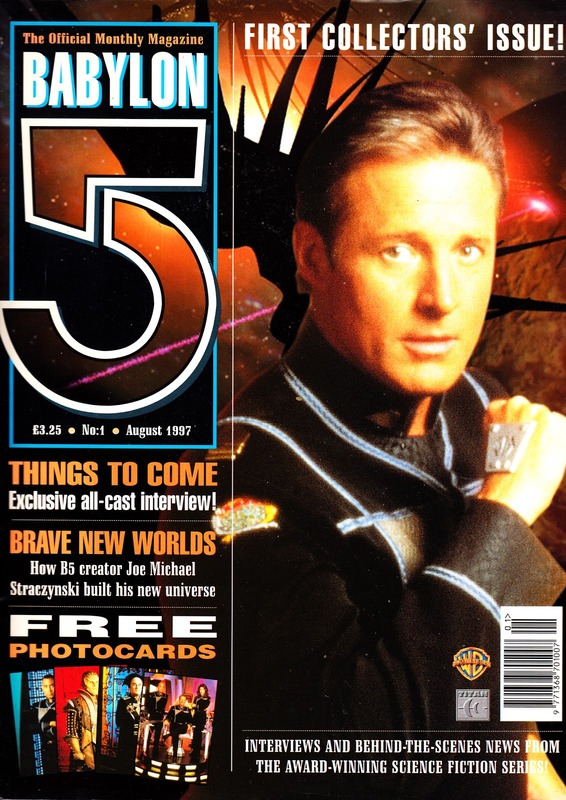 From August 1997: the first issue of the first volume of the ongoing BABYLON FIVE OFFICIAL MAGAZINE, published by Titan. Although this was the first of the ongoing run of UK originated magazines, there had already been an American one-shot which Tiutan picked up for the UK and published with a new (and not very creative) cover. I've posted the one-shot in the past. Titan must have been impressed with the sales figures as they then launched this: a British magazine with all-new content, initially edited (as was many a media tie-in) by John Freeman. The show itself had just wrapped its penultimate season in '97 and although perennially marginal in terms of future survival (partly because of structural changes in the broadcast industry, reducing demand and timeslots for first-run drama not offered by the networks or the next generation of quasi-networks), it did look like its fortunes were on the upswing thanks to a deal with Warner-owned cable outfit TNT to air the fifth season, spin-offs movies and a second TV series (the doomed-before-it-aired CRUSADE). So Titan must have felt confident that there was some longevity in the format. Freeman looked back to his past on DOCTOR WHO MAGAZINE and STAR TREK for his formula: the bulk of each issue was new editorial, supplemented by a comic strip licensed from DC in the States. The US issues had only limited distribution in the UK several years earlier so these were a good fit for the bulk of the readership. The reprints were possible because Titan only officially had the license to publish the magazine in the UK with little or no international distribution. The deal went global the following year and rather than retain the existing numbering, Volume 1 was cancelled... And immediately replaced by the all-but-identical (save for the comic strips) Volume 2. The first volume ran for nine issues.